Long Painting Company had already been an established professional coatings application provider for over 20 years when they realized a lucrative potential in the neighboring Hawaiian Islands in 1989. During the 1990s, Hawaii experienced a boom in construction, directly correlated with a swell in Japan’s economy. According to Honolulu Magazine, Japanese investments had begun pouring into Hawaii after a 1985 trade agreement weakened the dollar against the yen. John Fisher, head of the Marine and Industrial division at Long Painting, spoke about the decision to move to the islands. Over one mile long and boasting 1200 rooms, this high-level resort was a major project for Long Painting. The Waikoloa Hyatt Regency provided Long Painting the opportunity to get a foot in the door to the Hawaiian market, and while there, the company was able to pick another major project working on the Hyatt Regency in Kauai. While Long Painting stayed busy working several resorts at a time, Fisher said the company received major push back from the local contractors in the area. Long Painting worked on four of the biggest four-star resorts during the construction boom, and was able to supplement smaller painting jobs in the interim, such as schools and municipal buildings. But anyone who was a part of Hawaii’s yen-fueled party would soon come to find it was over as quickly as it had begun. By 1992, construction started plummeting, as many Japanese-financed projects were halted. 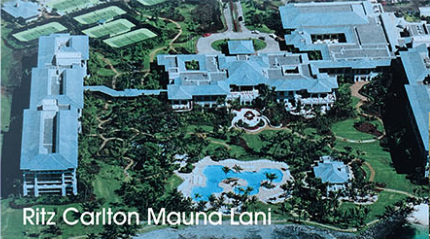 One of the final jobs Long Painting was a part of was the Mirage Princeville Hotel on Kauai. After a seven year run, Long Painting made the executive decision to close up shop and shut down the Honolulu office. While Long Painting did not return to the islands, the short run in Hawaii proved to be a great decision for the company.